We bring you the latest ADP data for 2QB leagues. Which players make major moves in the format? It’s time to celebrate! We are in NFL Draft month! With just a few short weeks until we learn the landing spots of all key incoming rookies, the puzzle that is a players’ dynasty value is nearing completion. We will soon add draft capital and team situation to the pieces we’ve already placed, including college production, metrics and Combine and Pro Day performance, along with other information. As dynasty owners continue to understand the value of the incoming rookies, mock drafts show how that value is changing, even during the off-season. I recently completed several 2QB rookie mock drafts and have some brand new average draft position (ADP) data to share. I’ll also include the ADP change since our previous data collection benchmark in late February. In addition to his role as Senior Staff Writer here at DLF, Ryan is also a husband, father of three and second grade teacher. Ryan is the commissioner of multiple dynasty leagues, most notably the HyperActive Dynasty Leagues. 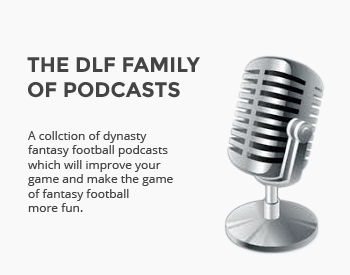 Here at DLF, Ryan’s focus is on identifying, monitoring and analyzing player value. Check out Ryan’s work on the Weekly Impact Events and Dynasty Stock Market, as well as our dynasty ADP data. i’m in 10 team superflex, i have weak/thin roster. last year I picked deshaun watson at #17. if qbs, fall like this is it better to take qb or fill other positions? i have cam, deshaun, trubisky. i pick #2 (guice), #12, #19, #22. at #12 would taking james washington, freeman or qb that falls like mayfield or rosen make most sense? Id be happy getting Guice and Freeman at 2 and 12 with that roster then take best available at 19. If you can package 12 and 19 to move up for Michel I’d be even happier but I doubt you can find a trade partner for that. Mayfield seems high at 1.04. In a real draft today, I bet both Georgia RB’s and darnold go ahead of him. I have picks 2, 4, 5 in my 12 team superflex. Still can’t believe Allen hasn’t cracked top 12 yet seeing that he’ll be a top pick in the draft. I have no starting QBs and in complete rebuild. Plan was to go Rosen/Darnold at 2 then Allen, Mayfield 4&5. Trading pick 5 is also a possibility as I’m not psyched about Mayfield. Thoughts? Thanks! Would the Mahomes owner take the 1.04 for him?